I finally got an idea for my title last night - a play on the word "deadline." Of course the first thing I did was stick "deadline" in an Amazon book search. It came back with about seven different books, all titled "Deadline." 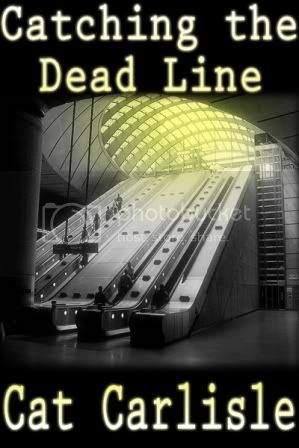 I don't need that kind of competition, so I decided to go with "Catching the Dead Line" as my rough draft title. It's better than what I had been calling it, which was "Something With Death in the Title"! Based solely on the title and cover, what do you think my story is about? I'm curious to see how effective the title and cover are in getting the story across. There's no wrong answer! Please post your thoughts in the comments. Thanks! Last Sentence: As he passed a set of cranes, relics from the days when the docks where home to ships and warehouses instead of luxury flats and trendy restaurants, he caught sight of something out of the corner of his eye. I think it has something to do with trains or subways, maybe a mystery on the train. Based on the cover and title I'm guessing there is a killer loose in the subway system somewhere?